Every now and then a TV network will knock back a proposal, only to see it get picked up and become a success elsewhere. One of those programs was a World War II drama called The Sullivans. The concept had been offered by Crawford Productions to the Seven Network, which declined to pick it up. 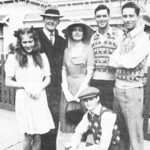 With the era of adults-only soaps Number 96 and The Box coming to a close, the Nine Network approached Crawfords in 1976 to devise a new family series. Hence the original idea was dusted off and put forward to the network. Items such as old 78 records, pub mirrors, advertising posters, household items, kitchen utensils, jewellery, furniture, clothing and even cars were collected to either be used for the series or, as a last resort, to be used for recreations. “When you are dealing with a period of time that is well within living memory, you have to watch things very carefully. Most people have good memories when they recall younger days and one thing out of line will bring a lot of complaints. Therefore my aim in designing the show was to make no mistakes at all,” Rossendale said. Crawfords had also bought a modest 1930s period home in the suburb of Canterbury that would serve as the exterior for the Sullivans’ Camberwell home. The white weatherboard house has since been demolished but has become immortalised forever by its appearances in the show. Meanwhile, research was also taking place through old newspapers to gather information on current affairs and even the weather. As the series was planned to tell its story on a day to day basis, using actual dates, it was important to be sure that even the weather conditions from the day would be depicted accurately. A total of fourteen writers had been employed to bring storylines to the series, again paying close attention to the period being depicted. Casting was completed relatively late in the pre-production process. Filming for the show was due to start in late September 1976, but with only a few weeks to go before production only two cast members had been signed — and they were for supporting roles. 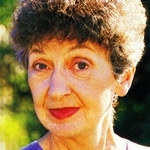 Vikki Hammond, a performer on variety shows in the 1960s, was signed on for the part of divorcee Maggie Hayward, and Noni Hazlehurst, formerly of The Ernie Sigley Show and The Box, for the role of Lill Duggan (pictured), a neighbour of the Sullivans. Paul Cronin, best known from police drama Matlock Police and its spin-off Solo One and sensing a lull in his acting fortunes, was set for a new career in real estate before he was short-listed for the lead role of Dave Sullivan. Producers ended up choosing Cronin over Terence Donovan, who had appeared in the former Crawford series Division 4. Donovan was also reported to be reluctant to take on the role of a mature father figure. 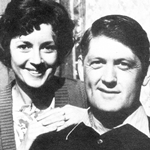 The part of family matriarch Grace Sullivan was to go to Lorraine Bayly, a stage actress who was familiar to many as a presenter on Play School as well as from the occasional guest role in other Crawford dramas and in TV commercials. The four Sullivan offspring were played by Andrew McFarlane (Division 4), Stephen Tandy (The Unisexers), Richard Morgan and Susan Hannaford. Other founding supporting cast included Vivean Gray, Norman Yemm, Maggie Dence, Michael Caton, Peter Hehir, Leon Lissek, Reg Gorman, Fred Parslow, John Bowman and Ingrid Mason. Episode one made its debut on TCN9, Sydney, and GTV9, Melbourne, on Monday, 15 November 1976. It was one week after Nine had launched The Young Doctors, with both shows running back-to-back over the summer non-ratings period of 1976-77. The first episode started at 1 September 1939 — two days before the declaration of what would become World War II. The outbreak of war was to forever change the Sullivan family and the series followed their daily lives not just in Melbourne but also in remote overseas battlegrounds as various family members were serving for their country. Producers and designers were once again meticulous in reconstructing some of these diverse locations from sites around Melbourne. Nine’s confidence in commissioning the series, affording it a generous budget and allowing for considerable research was well rewarded. 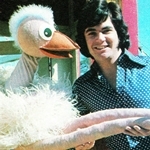 The series was a ratings hit, topping the national ratings in 1979, and within months of its debut had clocked up its first Logie win. The show’s biggest Logies haul was in 1978 when it collected five awards. The series was sold to over 30 countries including the United Kingdom, Canada, Mexico and Greece and inspired a spin-off telemovie, The John Sullivan Story. The Sullivans‘ success also made it an easy target for parody back home. Hey Hey It’s Saturday featured a series of sketches called The Sillivans (“a Crawfish Production”), and Paul Hogan and Marion Edward sent up Dave and Grace Sullivan in The Paul Hogan Show. Over the series’ run it also featured early appearances by Mel Gibson, Sam Neill, Gary Sweet, Damon Herriman and a ten-year-old Kylie Minogue. Other actors to feature during the show’s run included Megan Williams, John Walton, Genevieve Picot, Ilona Rodgers, Lisa Crittenden, Jamie Higgins (pictured with Cronin and Bayly), Chantal Contouri, Maggie Millar, John Waters and Andy Anderson. Bayly left the series in 1979. Her dramatic exit, with Grace killed by a bomb in London, was one of the show’s most famous storylines. It was also an emotional farewell when Aunty Rose (Maggie Dence) tragically drowned following a New Year’s Eve picnic. World War II ended in 1945 which was shown in the series in 1981. 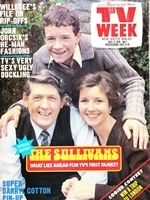 The series continued with optimism that it would capture the booming post-war period and the impact on projects like the Snowy Mountain Scheme, but when Cronin decided to leave the series in 1982 the show was cancelled. The series came to a close with episode 1114. set in the year 1948. 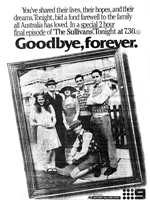 Melbourne’s GTV9 aired the final two-hour episode on Thursday, 10 March 1983. Just as Nine had placed a full-page ad in the day’s newspapers (pictured), rival channel ATV10 was rather opportunistic in doing the same to promote its recently-launched 1920s drama Carson’s Law, another Crawford production starring Bayly in her TV return. In 2012 The Sullivans was first released on DVD, starting as a volume of the first 26 episodes. The final volume of episodes has only recently been released. Source: TV Week, 17 July 1976, 11 September 1976, 20 November 1976, 15 July 1978, 9 December 1978. TV Times, 23 October 1976, 6 November 1976. Scene, 20 May 1978. The Sun, 10 March 1983. Super Aussie Soaps. I was the founding producer for the series. For the record, there was a rush (given that it was a period show) to get into production. I had been the producer of Matlock for some time and when that folded I created SOLO ONE for Paul Cronin. I only ever had Cronin in mind for Dave. The Network wanted Terry Donovan and Monica Maughan for the leads but I had other ideas. We had great trouble finding Grace and auditioned many. After a final look through the SHOWCAST directory I identified Lorraine Bayley. We flew her to Melbourne and rest is history. From memory we secured her in a Friday before filming on Monday. Hector hated the characters on Uncle Harry and Mrs Jessup and we argued quite forcefully. I put the position that the drama needed some humour to balance the war stuff. They were retained and became very popular characters. Henry, it’s wonderful to get an insight from the show’s founding producer! You must be so proud to have been involved in something that has become one of the iconic series of Australian television.